NOAA has released an impressive time-lapse of Earth's Western Hemisphere, comprised of still images taken by GOES-17. 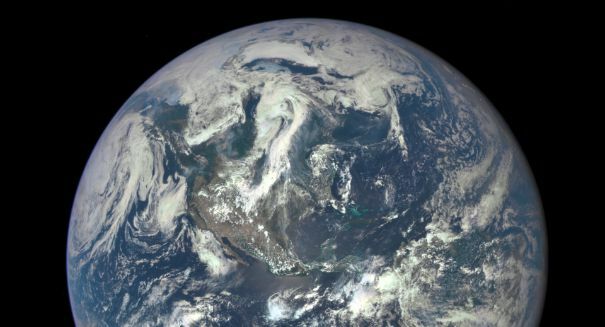 U.S. scientific agency, the National Oceanic and Atmospheric Administration (NOAA), launched their latest weather satellite in 2017, which encountered tremendous malfunctions and managed to recently convey incredible images of the Earth. GOES-17, a weather satellite that is a part of a larger NOAA satellite web for tracking storms, was in Earth’s orbit for less than 3 months out of its 15-year mission before it malfunctioned. While out in cold space, the satellite’s cooling system failed to start up properly, and this impacted its ability to take images of the planet’s surface. Fortunately, it was only infrared and near-infrared imaging capabilities which were lost, and the visible light imaging tools were still online. Most recently, the NOAA has released an impressive time-lapse of Earth’s Western Hemisphere, comprised of still images taken by GOES-17. The high-quality, 1080p resolution video displayed sharp images. The GOES-17 is the most advanced satellite in the weather agency’s long-running Geostationary Operational Environmental Satellite program (GOES). The satellite web, which NOAA refers to as “geostationary constellation”, is currently made up of four weather-tracking satellites, the oldest of which is approximately eight years of age. Together, the GOES “constellation” is responsible for storm tracking, weather forecasting, and general meteorology. GOES-17’s inability to see in infrared creates hindrances, as it was supposed to be responsible for monitoring weather patterns around the entire western half of the United States. The NOAA deemed this role “GOES-West,” and that role is now permanently held by the previous satellite GOES-16. NOAA remains with three other satellites to take on the responsibilities that GOES-17 is currently unable to perform. However, these satellites are not the only storm-tracking satellites orbiting the planet. Nevertheless, GOES takes great photos, able to capture “dust, haze, smoke, clouds, fog, winds and vegetation” according to an official NOAA statement. The photo released by NASA has effectively detailed the extent that allows viewers to scan a photo of the entire hemisphere. According to NASA, the GOES-17 satellite was launched into space on March 1, 2018, by an Atlas V (541) vehicle from Cape Canaveral Air Force Station, Florida. It had a launch mass of 5,192 kg (11,446 pounds). On March 12, GOES-17 joined GOES-16 (launched in 2016) in geosynchronous orbit at 22,200 mi (35,700 km) above Earth. The satellite was built by Lockheed Martin, was based on the A2100A platform, and will have an expected useful life of 15 years (ten years operational after five years of standby as an on-orbit replacement).